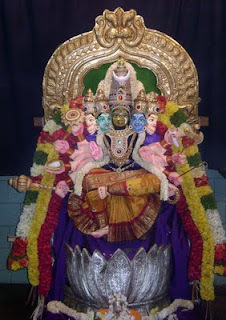 Grand Navaratri Festival Celebrations are on at all major temples in Ramanagaram. Sri Vasavi Temple, Sri Chamundeshwari Temple, Sri Bannimahakali Temple, Sri Balamuri Ganesha Temple, etc are few temples that are attracting crowds. At Vasavi Temple on M.G.Road Goddess Vasavi was decorated as Sri Gayatri Mata. Mr.Ananta Satyam and his brother Mr. Radha Krishna (sons of Sri Nagaraja Shastri, ex temple archaka) took enough pain to decorate. The decoration drew attraction of hundreds of worshippers around the town and the publicity was wide. This was indeed a good 'alankara'. Thanks for sharing.